It’s snowing! Well, not in San Francisco, but in much of the Country it is. Christmas was filled with inches upon inches of snow and a lot of cancelled flights. Hearing all these reports made me…envious! 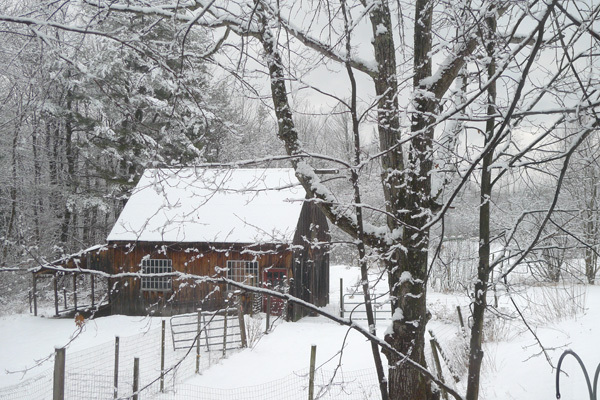 Last holiday season I was in New England where it snowed and snowed and all was peaceful and picturesque. This is the view from the guest suite at my future in-law’s home, and if I stare at it long enough I can imagine that it is snowing now! Isn’t that you, Natalie, peeking out the window at me? smooches, and I wish you were here . . .